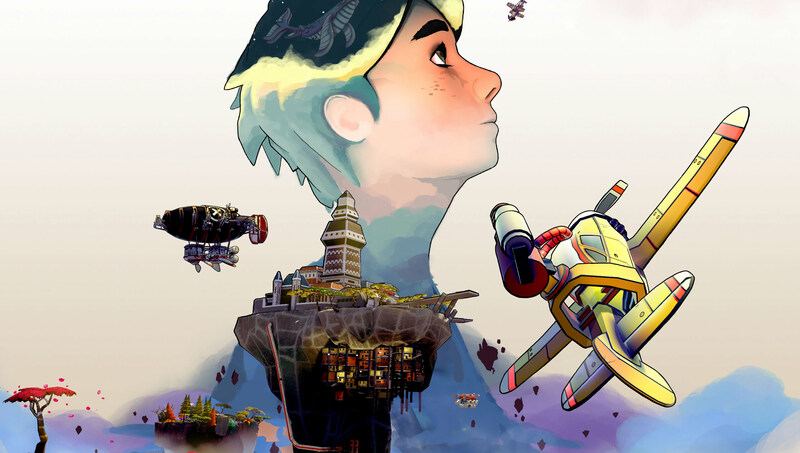 Half twin-stick shooter, half roguelite exploration, Airheart follows young pilot and fisherwoman Amelia as she aims to navigate and shoot her way to the top of the stratosphere for wealth and glory. A dieselpunk styled top-down shooter, Airheart drops you into the pilot seat of a small yet sturdy fishing plane, tackling pirates and collecting skyfish for cash, steadily upgrading the aircraft to ultimately reach and take down the great whale in the sky — a bounty of untold riches. Young pilot Amelia dreams of the day that she can leave the poor underbelly of port town Granaria, and vows to make her late father proud by going after the most prestigious, unattained fishing bounty available: the great skywhale, drifting alone high in the stratosphere. To get there, she’ll have to risk the gamut of dangers between Granaria and the whale, including armies of pirates and their bases, as well as other dangerous skyfish. 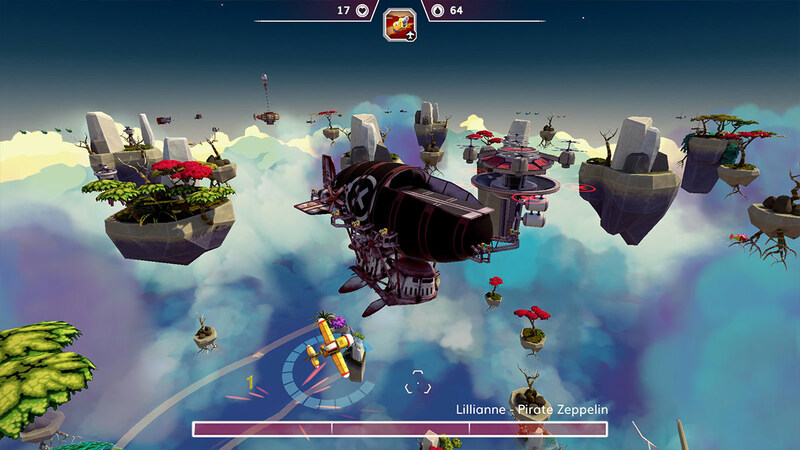 The basic premise of Airheart is a relatively short gameplay loop in which you’ll fly around various layers of the skies above Granaria, collecting skyfish to sell and facing off against increasingly dangerous and well-equipped pirates the further up you go. Every layer is distinct with its own ecosystem of fish and general danger level, and each having a station which’ll boost you up to the next layer. Once you feel like you’ve collected enough fish — or more commonly, when you don’t want to risk running on low health any longer — it’s a quick trip back down to Granaria, nosediving back through every layer in realtime, dodging rocks and obstacles until you reach home and sell off your latest haul and work on upgrades. Fishing is simple enough: All skyfish you’ll initially come across are small and can be simply flown into to collect; you’re also equipped with a versatile harpoon which can be fired at fish to prevent them from darting off at high speed. Once you start reaching new zones such as Autumn Forest and Snow Crest Altitude, you’ll start to find bigger fish who are too large to bring aboard and will instead damage your plane on impact — some will even consider you prey. While it took me some time to figure out if they were fishable or simply enemies, I had a satisfying “wait a minute!” moment when I figured out that they could be harpooned and then simply dragged back down to Granaria, fish in tow. Of course, you won’t be simply fishing in peace. While the first layer will introduce you to other fisherfolk who are competing for the fish (and they’ll be around for a good few layers), you’ll soon bump into pirates. These scourge of the skies love nothing more than flying around the skylayers, attacking anyone they find and installing automated defenses on any floating island they can get their hands on. While initially not a huge threat, these guys will soon start packing much more firepower than your little plane could hope to match, so tackling them requires patience and a little finesse. In fact, that’s a major point where Airheart differs from a lot of twin-sticks. Most twin-stick shooters rely on reflexes and frantic, overwhelming action, but Airheart instead rewards more calculated play. Zoom around blasting everything in sight, and you’ll find yourself blown to pieces, whether by pirate or (if you happened to attack friendly craft) the local police. The trick in taking down many of the large pirate ships is instead slowly chipping away at them, deftly using your harpoon to pull off shields and even their weaponry in order to leave them exposed, defenseless targets. The versatility of your harpoon actually tends to be one of the game’s strongest suits. It can be used tactically such as tethering yourself to a nearby rock, letting you focus on aiming without having to keep flying around in circles; alternatively, more aggressive uses include harpooning a small enemy plane and either dragging them behind you to line up easy shots, or simply swinging them into a rockface to completely obliterate them. 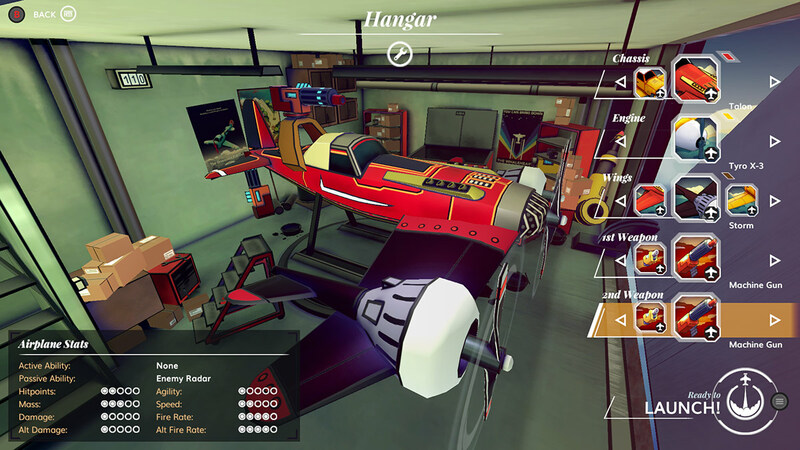 Progression in Airheart is mostly down to upgrading your plane with new parts, either purchased directly from the local shop or crafted using various materials salvaged from defeated enemies. Various parts of your plane can be replaced, boosting health and speed as well as adding new abilities such as being able to detect offscreen enemies, deploy debuffing clouds or summoning helpers to aid in fights. While buying from the shop is as straightforward and dependable as you’d expect, crafting is another matter entirely. Combining materials in various ways can create more advanced materials, ultimately able to fuse together to create new parts or weapons for your plane, and while failed combinations consume the materials used you’re slowly given vague hints to help prod you towards successful mixes. Unfortunately, crafting is one of Airheart‘s major pain points. The game enjoys roguelike influences — which are random/procedural content, repeated playthroughs and deaths, and persistent progress — but while it taps into the first two strongly enough, persistent progress across playthroughs isn’t available. 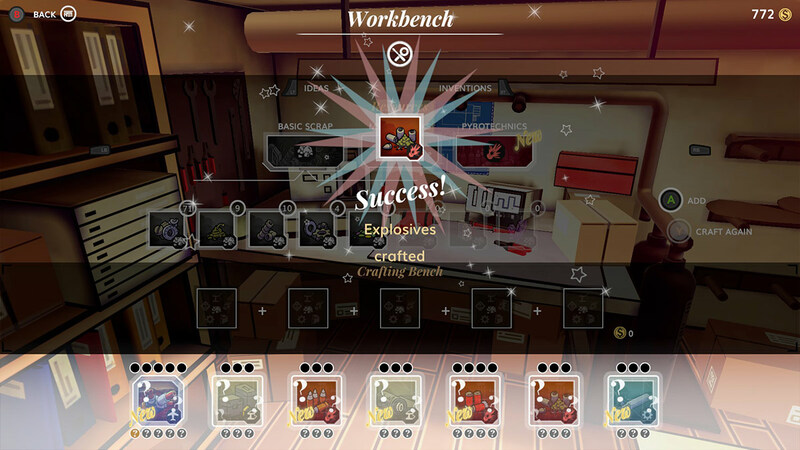 Successful crafts, as well as outright purchases of new parts, open up details about those results on an inventions tab which details exactly what’s required to craft it in future; however, this is reset to completely empty once you hit a game over. If successful recipes stayed available to check at any time then making progress to catch up to and beyond previous runs would be greatly more enjoyable, but in the current state you’re forced to either write down or screenshot each recipe as you discover them just to avoid all the headaches of failed crafting in future. Ultimately Airheart is a reasonably fun game. It’s a nice new spin on the twin-stick/roguelite genres, favoring a slower pace and deliberate actions. The game is a little grindy at times, with initial upgrades taking quite some time to unlock unless you’re willing to go beyond your comfort zone to higher areas — or simply break the law and try taking down friendly merchant ships and their police presence — and starting over from scratch feels painful, rather than just another typical step on a roguelike progression treadmill. The balance is fun and general gameplay is enjoyable; with some nice quality of life changes such as being able to completely bypass the tutorial after your first time playing (having to skip through each time is tedious) and a persistent invention recipe collection, the game could be wonderful.